I've never heard of the Tang Jai Yoo until I watched the Bangkok Episode of No Reservations where MCDANG (a Famous Thai Food Critic) took Anthony Bourdain to Tang Jai Yoo to sample their suckling pig. Afraid we couldn't get a seat we made a reservation in the morning at their original Chinatown Branch which was situated in a small street of the main Yaowarat Road. The restaurant looked very modest but was completely packed when we arrived. While waiting for our food I stumbled upon their roasting pit which was just located right next to the restaurant. Roasting the suckling pig was done the traditional way here where the chef would carefully spin and bast the suckling pig over a hot charcoal pit to give it an even and crispy pig. The first dish to arrive was our Sharks Fin Soup that was served in a mini clay pot. They were very generous with the sharks fin and the soup was thick and flavorful. I actually enjoyed the soup without much vinegar. Zhao Phin ordered his favorite Braised Goose Feet with Noodles. Their version is a little different from Iata Pata where it was a little less peppery and had more gravy. Nevertheless it was very good. Stir-Fried Vegetables with Garlic came next. The vegetables were quite nice with the soy-based gravy containing a little heat from the chili. In the midst of clearing up our food, our Suckling Pig finally arrived! The presentation was so beautiful with the skin evenly roasted and sliced. The first thing I noticed when I picked one up was how skilled they roasted and sliced the skin. There was virtually no fat at all which made the skin super crispy! 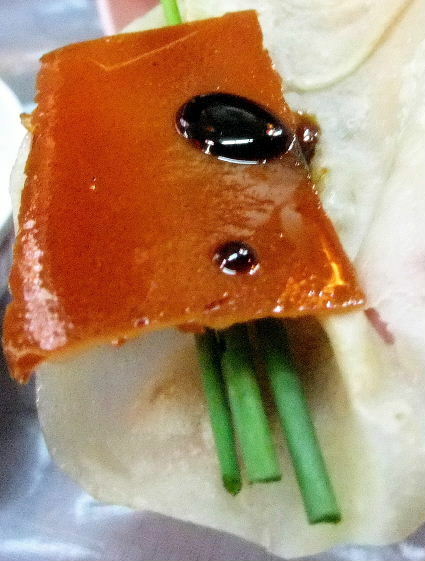 We finished every piece of skin as we wrapped it with the warm crepe and hoisin sauce. This was easily the best Suckling Pig Skin Sam, Phin and I have had so far. The second course of the pig however was rather simple. The restaurant only had one option, which was to deep fry the meat and carcass with garlic. I was a little hesitant at first because I remembered how dry the second course of the Peking Duck at Iata Pata was when they deep fried it. However this dish turned out pretty moist. Maybe it's because of the higher fat content of the meat preventing it from drying out. We were so stuffed at the end of our meal but we were given a complimentary dessert of a plate of Sugar Coated Deep Fried Taro. The taro had a nice thin crust and was very soft on the inside. It also wasn't very sweet which was a nice way to end our meal. Our entire meal cost us THB 3,000 including tips, taxes and a bottle of beer. Considering it is a very famous restaurant and we had Sharks Fin Soup and an entire Suckling Pig this meal is cheap. After having Iata Pata's Peking Duck and Tang Jai Yoo's Suckling Pig, Phin and I are convinced that anything to do with skin the Thai Chinese seem to do it the best. I want to eat that suckling pig right now!